In the summer of 1921, Johnny Weissmuller broke the world record for the 100-yard event in open water. The previous owner of that record was Duke Kahanomoku, the amazing Hawaiian swimmer who won five medals over three Olympics spanning the years 1912 to 1924. As Weissmuller won race after race, and broke record after record, the lanky, broad-shouldered boy from Chicago was building a reputation for invincibility. No one could beat him as he crossed over into 1922. But many at the time believed that, until he defeated the champion from the 1920 Antwerp Olympics, Duke Kahanamoku, Weissmuller would not be considered the fastest swimmer in the world. At the end of June, 1922, a faceoff was looking very likely as the AAU National Championships were being held off the beaches of Honolulu Hawaii, where Kahanmoku lived. And the press, according to David Davis, in his well-written biography of Duke, called “Waterman“, were licking their chops in anticipation of this battle of the titans. The newspapers played up their differences. Duke was symmetrically muscular with a powerful upper body and thighs that seemed custom-made for springs. Johnny had “wide shoulders, flat belly, no hips or buttocks, long, slender, smooth-muscled legs and arms,” according to sportswriter Paul Gallic. Duke was a pure sprinter; Johnny was versatile enough to win at distance events up to 500 meters and at other disciplines besides the freestyle. Duke was old school: reserved and circumspect. Johnny was jazz age: he liked to play the rogue and was an inveterate skirt chaser…. The anticipation that Duke, the human fish, would face off against Johnny, the human hydroplane, was keen. In the end, the public did not get to see Kahanamoku swim against Weissmuller in the AAU National Championships. Weissmuiller was there. The Duke, he was there. But only Weissmuller entered the pool. According to Weissmuller’s coach Bill Bachrach, in David Fury’s biography of Weissmuller – Twice the Hero – Kahanamoku wisely pulled out of the competition, with some prompting by Bachrach himself. The coach said he gave Kahanamoku his stopwatch and time him himself. Bachrach sent Johnny into the 25-yeard Punahou pool, and he swam at his top speed as the Duke timed him for 100-years. Kahanamoku was stunned as he watched Johnny swim faster than the Duke had ever done, confirmed by the stopwatch held by his own trembling hand. There was fear in the Duke’s heart, because he knew if he raced on the morrow he would be beaten by this relative newcomer to the swimming wars. The next day, all newspapers announced that the Duke had taken ill, and had left Honolulu to recuperate. 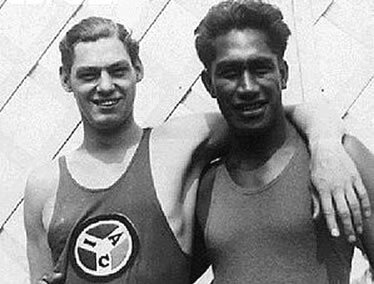 Of course, another consideration is that Kahanamoku was 14 years older than Weissmuller, and whose prime years went untested as the 1916 and 1920 Olympics were cancelled. So if Kahanamoku did decide to dance around possible encounters with the young and future king, it would not be hard to understand. At the end of the race, only Americans stood on the winner’s podium, the crowd saluting two of the century’s greatest champions. Posted in Other Olympics, Swimming and tagged 1924 Paris Olympics, Bill Bachrach, David Davis, David Fury, Duke Kahanamoku, Johnny Weissmuller, Twice the Hero, Waterman. Bookmark the permalink.